A backup is a root and is functionally the same as Synced Folder. It refers to the copying and archiving of your data so it may be used to restore the original when data is lost. For information on best practices, please reference the Best Practices for Creating Backups Knowledgebase article. Note: When backing up a folder and all of its subfolders, you must ensure that the folder allows for full SYSTEM control. Files within the folder structure must also inherit, or include, the SYSTEM permission. If SYSTEM permission is not specified, then those folders and files will not back up to the cloud. Can I Restore a Backup to a Different Machine? Select New Folder on the desktop client, create a folder and select its radio, and click Save. Can Changes Sync to a New Backup? 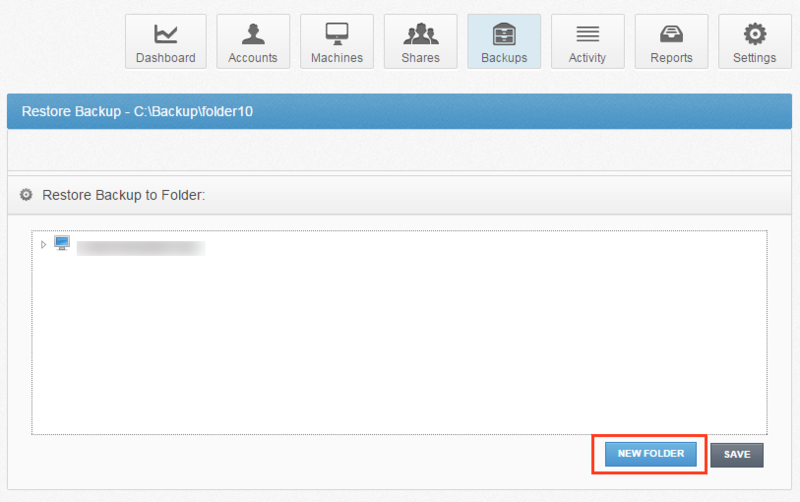 When you go through the steps to restore your backup, they are automatically synced to the folder you choose. Even when you rename the folder and put new documents in it, they will be synced as if they are in the Synced folder. The parent directory must be highlighted in order to create a new folder.